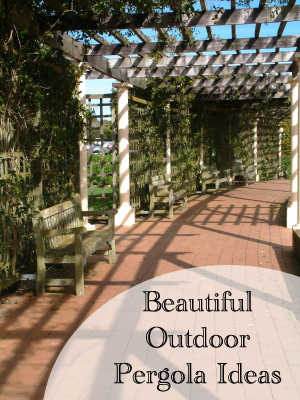 We just went to a home and garden show and saw some of the most amazing pergolas. I didn’t even know what that was until I became a HGTV groupie. Now, I WANT one. And we have the perfect place. Just on our side of the fence that separates us from the enormous 5th wheel just on the other side of said fence. The one our neighbor uses for his office 3 seasons of the year. I’m glad we love them so much or it could be a real problem.